The subscription business is different than the standard way of doing business, mainly because it shifts the focus from products to the customers themselves. Businesses that want to succeed in the subscription economy need to orient themselves around customers, rather than products. They need to understand how their products and services are being used and, based on this insight, constantly improve the customer experience. Using the comprehensive data obtained from subscription customers, companies can create tailored offerings that will resonate with new and existing customers. Today we’ll look into the different ways you can access this data for your WooCommerce subscriptions as well as how to get valuable insights from it. We are mainly going to focus on how to filter your customers by the plan they are subscribed to. This can be beneficial in many ways, especially if you are looking for ways to get the most out of your marketing campaigns directed for your subscription based business. 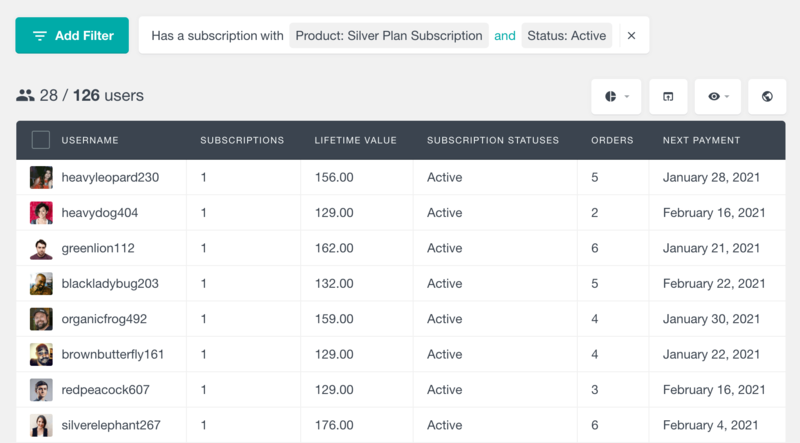 The WooCommerce Subscriptions Module of Users Insights lets you filter the customers by different criteria. 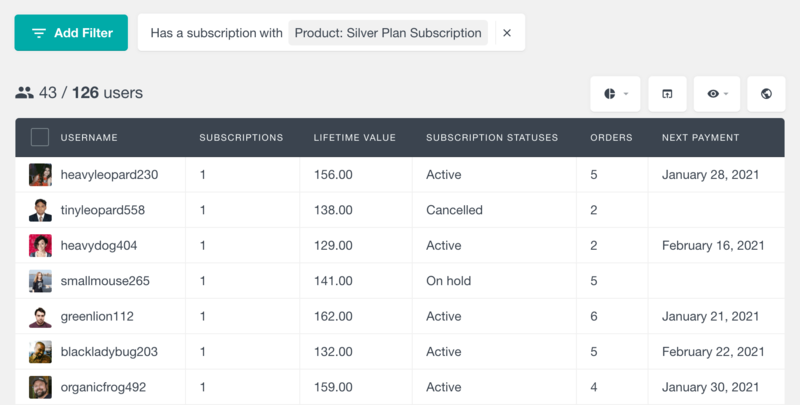 Let’s dive in to learn how you can apply a combination of filters to segment your subscribers by the plan they are subscribed to. Later, you can export this data to re-engage these customers in your new offers and services based on their order history. Getting structured data about your WooCommerce subscription customers lets you create email marketing campaigns and introduce new and improved offers to grow your business with time. Users Insights comes with a filter that allows you to search your users based on different criteria on their WordPress subscriptions. This includes the subscription product, its status, start date and end date. Once you select the filter from the menu, you will see a drop-down that lets you select the search criteria. After applying one criteria you can click on the “+” button to add another condition. If you would like to find which users are currently subscribed to a product, just add a “Status: active” condition to the filter. The following example illustrates loading all users who are currently subscribed to our Silver Plan. Including the status condition ensures that the users have an active subscription. This can be also confirmed by the “Subscription statuses” column. Lifetime value is essential in making important business decisions when you are running a subscription-based business. It not only tells you about your most loyal customers but you also get to learn how much your customers spend on average. Knowing the lifetime value of each subscription plan lets you create an effective customer segmentation and effectively allocate marketing budgets. The combination of these filters shows you exactly those customers who are subscribed to the selected plan and whose lifetime value is greater than a specific number. Similarly, you can play around with the combination of these two filters and make important business decisions e.g. whether you need to work on customer acquisition or creating more customer loyalty. Renewals are something that is the foundation block of a subscription-based business. If you would like to keep track of your renewals, you can combine the “Has a subscription” and “Orders” filters. The orders filter lets you filter by the number of orders that each customer has made. And since there is an order created for each renewal, you can use this field as an indication for the number of renewals. Please note that the number of orders does not necessarily reflect the number of orders for the currently active subscription. Some orders might have been made as part of another subscription that is no longer active. Similarly, you can find all the WooCommerce subscriptions with a one time purchase by using a “Orders equals 1” filter. There is no limit to experimenting and you could try a lot of different combination of filters to get important insights. For example, you are selling a subscription product on your website and you want to know which country has the highest number of your customers. You can get the results by applying two filters, the “Has a subscription” and “Country” filters. In this way, you would know where your customers are from and you could enhance your marketing campaign by targeting it area-wise. Of course, marketing campaigns would perform better with so much insight on your back and you would grow your business. You might have developed an idea as to how much insights we can get by applying a combination of filters. You could get more out of this data when you export it into a spreadsheet and apply the relevant formula to get more advanced metrics. For example, if you want to export data of your Gold Plan Subscriptions customers, apply the “Has a subscription” filter and then click on export button. The export file will include all of the currently visible columns and only the users from the filtered results. By exporting the users with their emails, you can then import them to your favourite email campaign service to send them an email. For example, you can send renewal reminders for those users who have an upcoming payment or an on-hold WooCommerce subscription. You can read more on exporting user data, in this article. In this article, we learned about the different ways of making the most out of the WooCommerce Subscription module. We also discussed several scenarios of filtering the members by different criteria. In this way, you will not only get to know your customers more, but you will also get to learn how your subscription plans are performing and how you can boost their performance.